In almost every city across the country, children, adults and entire families are hungry, homeless and without the basic needs to make it through each day. Thanks to the dedicated community of The Rock at NoonDay, there is hope and help for the homeless in Albuquerque, New Mexico. For more than 30 years, The Rock at NoonDay has provided nutritious meals, clothing, hygiene, school supplies and spiritual guidance through its day services. In collaboration with other service providers, staff and volunteers address these immediate needs so that guests can focus on school, employment, health, veterans benefits, and taking steps toward improving their lives. Danny Whatley, Executive Director, shares how The Rock at NoonDay lends strength, support, and compassion to those who are homeless or at risk of becoming homeless. What do you enjoy about your work with the organization? The Rock at NoonDay is an incredible place of hope and compassion. The interactions I have each day are so important. I have the opportunity to show the compassion of Christ and introduce the Gospel message. Those in need find more than help with basic physical needs. The Rock welcomes every person in, and reminds them there is hope. It is about much more than food or shelter. We help rebuild hope one person at a time. 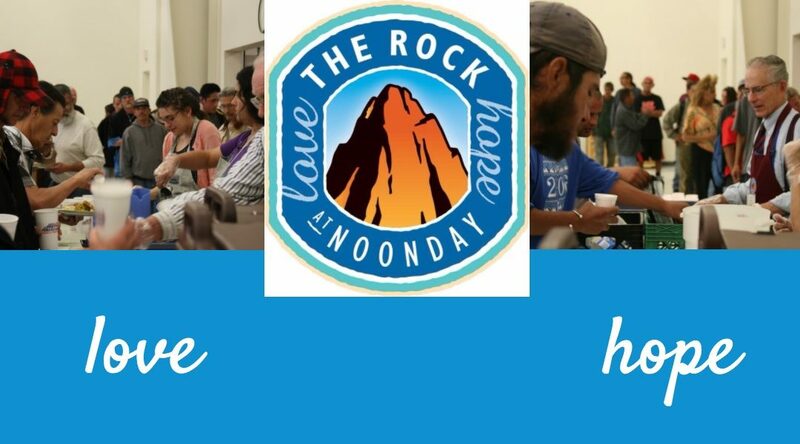 How does The Rock at NoonDay have an impact on homelessness in Albuquerque? The Rock at NoonDay is the shining light for the homeless and near homeless in the Albuquerque community. Our mission at The Rock at NoonDay is to go out of business by “Building Hope One Person At A Time.” We sincerely hope that one day, no person will be hungry, lacking shelter, or without basic provisions. But, until that day comes, we will strive to help God’s homeless children by providing nourishing meals, spiritual guidance, and many other essential services. The Rock meets the basic needs of the homeless, providing meals, showers, laundry service, phone access, mail service, clothing, day shelter, food boxes, and haircuts. Serving individuals and families of all ages, The Rock works with collaborative partners to provide on-site access to additional services such as housing, healthcare, legal aid and job skill training/opportunities. The Rock served 118,000 meals in 2016 and our volunteers served 1688 hours. The Rock provides a hand up, improving lives one person at a time. Tell us more about the community that supports your organization. The volunteers and donors who support The Rock at NoonDay are amazing. Giving of their dollars and time, these are the true heroes who make real help possible for the homeless. The Rock could not accomplish the daily mission of providing help without the endless volunteer hours served. They help prepare and serve meals, give out clothing, cut hair and brighten days with their smiles. Our donors provide the resources to ensure no person is alone and uncared for. These resources are a gift that brings hope to the hopeless and demonstrates compassion. As the safety net for so many, at The Rock at NoonDay we see need after need. Every resource available is used to meet those needs. More dollars means more needs will be met. The Rock needs your help in caring for the needs of those living without. Help tell our story, as it is really your story too. Our community thrives when we all work together to care for each other. Together we can do more to help those in need. What are your hopes for the future of The Rock at NoonDay? The Rock at NoonDay’s priority is to always honor God first. The Rock serves as the cornerstone in the Albuquerque community, bringing hope to the hopeless. With additional resources, The Rock would do more to meet additional needs of the hurting. How can people get involved with your organization’s efforts? Want to get involved with The Rock at NoonDay? Share your time and resources with us. Contact Karen Polich, Development Director, development@therockabq.com. We love volunteers and also have a team building program for groups who want to join us in making an impact. We also accept donations of clothing items, toiletries and non-perishable food items for food boxes. We think once you’ve seen our mission in action, you’ll want to get involved. What can you tell someone who is thinking about donating to The Rock at NoonDay? The Rock at NoonDay has been providing for the needs of the homeless in the Albuquerque community since 1982. What began with serving one meal a week has grown to 118,000 meals in 2016. The needs in our community are great. The Rock at NoonDay welcomes those who have lost hope and need a hand up. Your donation changes lives. You can help someone get back on their feet and restore their life. Every dollar makes an impact. Every donation meets the most basic needs of our hurting brothers and sisters. When you give, you are ensuring a family or individual is not alone. You can give at our website, www.therockabq.com and don’t forget to sign up with CaringCent today.